Words — Rad Parenting | She's an expert. He's not. Decorate a Memory Jar for each family member. Then fill them throughout the year with your good memory notes on little pieces of paper. 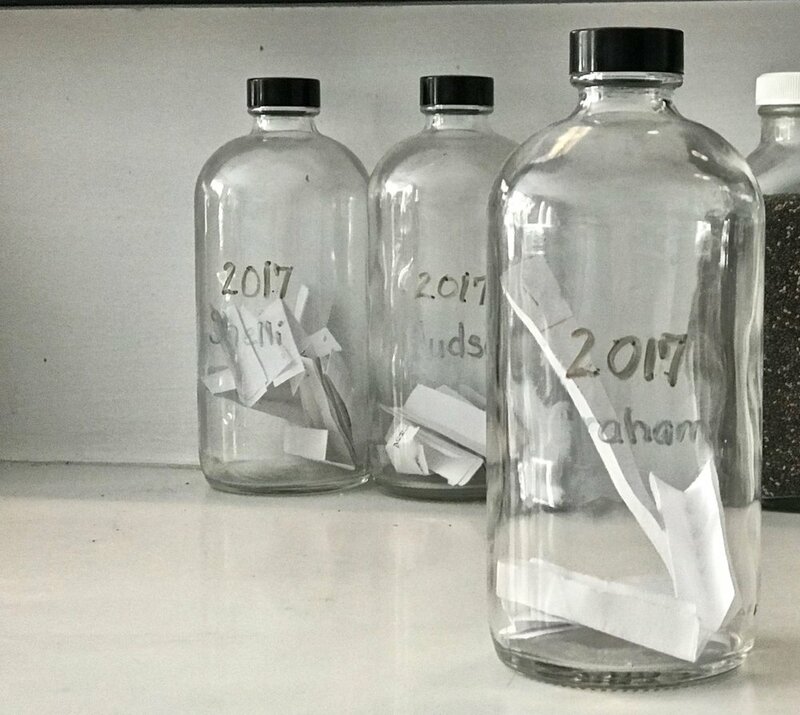 You decide: achievements or just things that make you smile... weekly or when the mood strikes... self reflection or adding notes to each other's jars. Here's to a 2018 filled with love, laughter and wisdom! And come 2019, you should each have a jar of smiles to open. The beginning of the day sets the tone for everyone. If we want our family to step out into the world on a high note, we need to understand how important it is to set the tone in the morning and limit the chaos. Routines give kids a sense of security and safety. The routines you create in the morning even help prepare your kids for adulthood. A routine is essential to your sanity too. Sit down with your partner and your children and decide what you’re going to do to ensure that you start mornings on a more positive note. Each night or beginning of the week, decide who’s going to be in charge of what for the coming week. Who’s going to make the lunches? Who’s going to get breakfast ready? Decide all the things ahead of time and there will be less scrambling. Mornings are so much easier when you get things done in evening. Have the kids lay out their clothes, make lunches, and prepare for whatever you need. It may not be fun, but it’s all about the routine. A lot of parents take on more than they should. They forget that they have a whole ‘crew’. If you're doing all the work, it puts way too much pressure on you. It also doesn’t give your kids the opportunity to engage in those routines. Give them responsibility and reduce your stress. If you have the lunches made, clothes laid out, you’re sending out positive vibrations to your family. If you can really control the environment to be positive-music on, breakfast made-the morning can be enjoyed. It makes a huge difference if you start your day early. Treat yourself and get in the right mood with a cup of coffee or meditation. When everyone starts coming down the stairs you’ll be prepared to deal with the morning routine in a positive way. Want a chance to have a private conversation with Anea about parenting? We’re giving away a 30 minute parenting session with Anea. Text the word parenting to 313131 to enter! For most parents, our primary goal is to give our children the tools to go out in the world and be healthy, happy, contributing human beings. By the time they become adults, we want them to be committed to doing and being their best, including being considerate of other people. When do we begin to teach our children to be considerate? From day freaking one. Oh but, you know how boys are. Kids will be kids right? They’re loud. They’re messy. This is the conversation we had on Rad Parenting Episode 51. Where is the line between letting kids do something that might upset other people and stopping inconsiderate behavior? We’ve all been there at the end of the day when we’re exhausted and our kids are going crazy. As hard as it is, there is some line where you have to stop your children from doing something disrespectful to other people. But what happens when we see someone else’s kid doing something disrespectful in our own house?Anea suggests you kneel down, look the child in the eyes, and say, “What would it be like if I did this to you?” They’ll either laugh or look confused, but in that moment, he or she will remember that an adult pointed out that behavior as wrong. Clearly, we can’t be berating someone else’s child or swearing at them. That’s never okay. We hope that the parent is taking responsibility, but when they aren’t, you can have a conversation with them. Tell the parent how you do it, how you focus on helping your children come to the world in a respectful way and the rule that you have in your house. If your friend is upset with that, you need to figure out if it’s a good idea to spend time with them. It’s likely that your child’s friends will come to your house and break rules that you’ve set. First, you should already be reminding your children from day one what your expectations are. When friends are over and not respecting those expectations, tell both your child and the friend(s) at the same time instead of singling out the friend. This will avoid putting the other child on the spot or evoking shame or defensiveness that will lead them to stop listening. Also, remind your children that it’s their responsibility to tell their friends what’s expected and let them know they can blame the restriction or rule on you. Final words of advice: correct behavior at every opportunity. There’s plenty of time to be a kid without being rude.